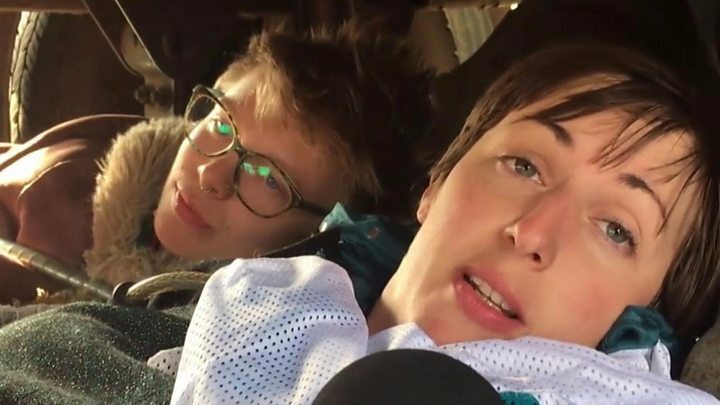 Nearly 300 climate change activists have been arrested after roads were blocked in central London, amid protests aimed at shutting the capital. A second day of disruption took place after Extinction Rebellion campaigners camped overnight at Waterloo Bridge, Parliament Square and Oxford Circus. Up to 500,000 people were affected by the diversion of 55 bus routes. The Met said 290 people had been arrested. During protests in Edinburgh, 29 arrests were made. Organisers said protests had been held in more than 80 cities across 33 countries. In London, motorists face gridlocked traffic on a number of alternative routes, such as Westminster Bridge and Blackfriars Bridge. Mayor of London Sadiq Khan said although he "shared the passion" of the activists, he was "extremely concerned" about plans some had to disrupt the Tube on Wednesday. "Ongoing demonstrations are causing serious disruption to public transport, local businesses and Londoners who wish to go about their daily business," Ch Supt Colin Wingrove, of the Met, said. Campaigners have been ordered to restrict their protests to Marble Arch after they caused widespread disruption on Monday. That order will continue until 21:10 on Friday. Three men and two women, in their 40s and 50s, arrested on suspicion of criminal damage at Shell's headquarters in London on Monday, have since been released while inquiries continue. The majority of the other protesters detained have been held on suspicion of public order offences. Mr Khan said it was "absolutely crucial" to get more people to use public transport to tackle climate change, and urged the protesters not to disrupt the Tube. "Targeting public transport in this way would only damage the cause of all of us who want to tackle climate change, as well as risking Londoners' safety, and I'd implore anyone considering doing so to think again," he said. But Extinction Rebellion has said it wanted to "shut down London" until 29 April. It called for "reinforcements" to help maintain the roadblock at Waterloo Bridge. Ben Moss, 42, from Islington, north London, said he had glued himself to the bars of the lorry as "personal action to the moral issue of the climate crisis and ecological collapse". "I'm doing this because I want the government to do something. I've got a week off work - if more is necessary I can make my excuses," he added. On Monday, a pink boat was parked in the centre of Oxford Circus where some activists locked their arms together with makeshift devices, while oil company Shell's headquarters on Belvedere Road were vandalised. It has three core demands: for the government to "tell the truth about climate change", reduce carbon emissions to zero by 2025, and create a citizens' assembly to oversee progress. One of the group's founders, Roger Hallam, believes that mass participation and civil disobedience maximise the chances of social change. Many people trying to travel across London criticised the disruption, while others said the vandalism was "disgusting". Peter Newport said on Twitter: "I agree with freedom of speech but if I can't get to work it's costing me money." One campaigner, who attended the protest with her two children, says she was protesting for the people who are "the most vulnerable, and least responsible for climate change". Most protesters say the police have been encouraging - despite the number of arrests - although taxi drivers and shoppers complained of the disruption. The government said it shared "people's passion" to combat climate change and "protect our planet for future generations". A spokesman said: "We've asked our independent climate experts for advice on a net zero emissions target and set out plans to transition to low emission vehicles and significantly reduce pollution through our Clean Air Strategy."